our products – product weight and required fastener torque are two of the most common. Our products have become increasingly larger over the years, as our product range has expanded and our EC motors began to proliferate. We now work with parts that are much heavier than previous generations. 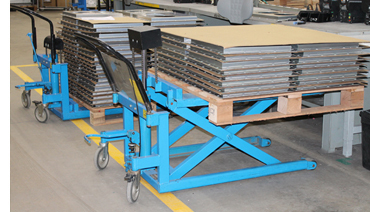 To avoid un necessary injuries (such as back strain or pulled muscles) from product lifting, we researched, specified and installed many lift assist devices. These devices range from the simplest form of a Scissor Jack, whereby the product pallet can be raised off the floor to a more comfortable 32” working height, to more elaborate larger crane systems. and then movement from station to station in a work cell. Typically, this type of crane assists in moving product through 3-5 stations in succession. Freestanding Jib Cranes perform the same assisted lifting – but only do this in a small circular area around their base. 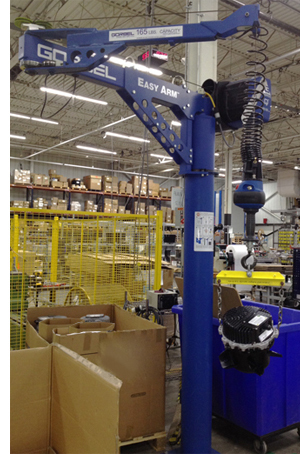 Typically, we use jib cranes to pull parts out of boxes, put parts into boxes, or assist with lifting in a single work space. Both are designed to keep operators from becoming fatigued over a full shift of work. The other related challenge is fastener torque. Along with our product sizes – the fasteners we use have also grown overtime. Generally, fastener torque is proportional to the size of the fastener. Torque is the twisting force required to install a specific fastener so that it tightens the mechanical joint and keeps it from separating. The issue with torque is one of physics – for every force there is an equal and opposite force. So, when we use a pneumatic or electric screwdriver to apply this force, there is an equal and opposite reverse force felt by the person (or device) that is holding the screwdriver. This is called a “torque reaction” or “break back torque”. If left unchecked, it can cause muscle damage, aches and soreness to operator wrists. So, whenever we use devices with higher torque values we employ an “ergo arm” or a “counterbalanced arm”. These arms are supplied by the makers of the screwdrivers and are designed to allow for free movement of the screw gun, while eliminating break back torque on the operator’s wrists. Typically, they also balance the physical weight of the tool – so operators can work for long periods using this tool with comfort. A lifelong tinkerer with a passion for product engineering, ebm-papst Inc. Director of Operations Brian Ladegard draws his expertise from the variety of engineering and sales positions he has held at the company over the past 20 years. He’s managed ebm-papst operations since 1996, including manufacturing engineering, production planning, component purchasing, production/plant operations, building maintenance and external contractors. Brian also oversees the company’s MRP planning, inventory control, capacity planning, bar coding, shop floor control systems and strategic sourcing activities.